With no confirmed release date for Patrick Rothfuss’ The Doors of Stone, the final novel in the Kingkiller Chronicle series, we are left to speculate other things about the book, such as what it will actually be about. When you think about what Rothfuss has to jam into this book to even relatively tie up all the loose ends he has sprawled on the floor of his literary universe, it seems quite daunting. Here is a sampling of the ten things that Rob Bricken of sci-fi/fantasy super site io9 believes Rothfuss will need to check off in his final book to achieve a satisfying conclusion (spoilers ahead). 1) He’s got to kill a king. The books are called The Kingkiller Chronicles after all, and now that Kvothe has told two-thirds of this story — although he’s only up to his late teens — he hasn’t met a single king yet, let alone killed one. 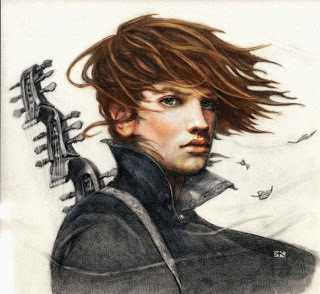 The popular rumor on the internet is that Kvothe’s archnemesis at the University, the noble brat Ambrose, will end up being king, although as it stands Ambrose is so far the way down the line of succession Kvothe can fight him pretty significantly and not get himself beheaded (not that Ambrose wouldn’t like to). 2) He has to figure out the mystery of the Amyr and the Chandrian. In a story about a story about stories, there are tons of tales that remain half-told, but the one that has to reach some sort of conclusion is what is going on with the Chandrian, the mysterious, seemingly cursed, possibly immortal group of seven who serve as the Chronicles’ main antagonists — as well as the Amyr, the order of church knights that had fought them until they also seem to have inexplicably disappeared. While most people regard the Chandrian as legends, Kvothe has first-hand knowledge of them — so it stands to reason the Amyr exist, too. But what happened, and where did they go? Be sure to check out the rest of the list at io9.